Texas police officers receive extensive training on the signs of intoxication and spend a good deal of their career dealing with people who are under the influence, whether they are driving or not. In Texas, an arrest for drunken driving is made every 20 minutes. The penalties for drunken driving; that is, operating a motor vehicle with a breath or blood alcohol level of .08% or higher, are severe. That’s why it is best that you know what police are looking for when they suspect someone is driving under the influence. First off, it’s easy to become impaired, and you need to know your limit when it comes to alcohol. Your weight and the number of drinks and food you’ve had affect how your body handles alcohol. Two or three beers can make some people legally intoxicated within an hour. Smaller people generally become impaired with less alcohol. People with certain medical conditions, such as diabetes, or who are on certain medications can be legally impaired with just one drink. Police are looking for signs of impairment, which basically means you do not have fully functioning reflexes necessary to drive a motor vehicle. That does not mean you are falling down, vomiting, or slurring your words. Most of the time, police will have to dig deeper to find signs of impairment. The classic sign is swerving while driving and failing to stay in your lane or to react to traffic lights. If police do not witness this, it is likely another driver will use their cell phone to call police, and you will be pulled over. Police will talk to you and make observations about whether you are speaking correctly or slurring your words, whether you smell of alcohol, have red or glassy eyes, or have other signs of intoxication such as not being able to answer questions. They will ask you to step out of your vehicle to observe your physical ability to stand, walk and follow commands. Failure to do any of these can also be evidence of intoxication. Police may ask you to perform what are called Field Sobriety tests, such as a walk and turn and stating your ABC’s out loud. They may also perform a Horizontal Gaze Nystagmus test. Police will use their finger or a pencil and wave it left to right in front of your eyes. They will watch how your eyes track it, or whether your eyes “jump” left to right – indicating impairment. Again, physical disabilities or diseases can affect these results, and you should tell the officer if you have any. You may also be offered a breath test. You may refuse it, but that carries a penalty. The tests measure your alcohol level when you blow into the mouthpiece of a device called an Intoxilyzer. Texas uses the “Intoxilyzer 5000” or the “Intoxilyzer 5000en,” depending on the county. If the concentration is .08 or greater, the officer can arrest you for DWI. But you can challenge the results by calling into question how the test was given and whether the machine was properly functioning. One test that is more reliable for police evidence is the blood alcohol test to determine the amount of alcohol in your system. The test is done at the request of an officer, but the officer does not draw blood. Instead, it is drawn by a doctor, chemist or nurse and must be done under certain conditions in a sanitary place. However, the results may be inaccurate for any number of reasons and can be challenged. If you have been arrested and charged with driving under the influence of alcohol, you need an experienced DWI defense lawyer on your side. 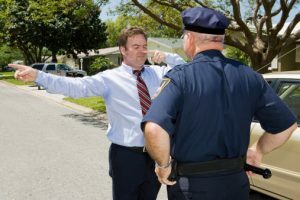 Police may be trained to spot the signs of intoxication, but they are far from infallible, and a good attorney can call into question the evidence supporting the DWI charges against you. Contact Joseph LaBella & Associates and find out how we can help you. This entry was posted on Tuesday, May 22nd, 2018 at 10:15 am and is filed under Posts. You can follow any responses to this entry through the RSS 2.0 feed. You can leave a response, or trackback from your own site.